In an previous post we looked at why an ecommerce store's basket page is so important. Streamlining the checkout process from this point onwards is one of the most effective ways to increase conversion and prevent shopping cart abandonment. But are you capitalising on the technology tools available to help streamline the experience you deliver? Sure, when it came to using Magento 1.x, the checkout experience on offer was fairly lackluster. It was slow, clunky, and had way too many steps – all while hiding your previous steps in that horrible accordion system. Not great. But thankfully, Magento 2 has totally reworked the checkout from the ground up – not only in terms of the customer experience, but also from a technical point of view. Let's take a look at how to get maximum value from the new Magento 2 checkout. 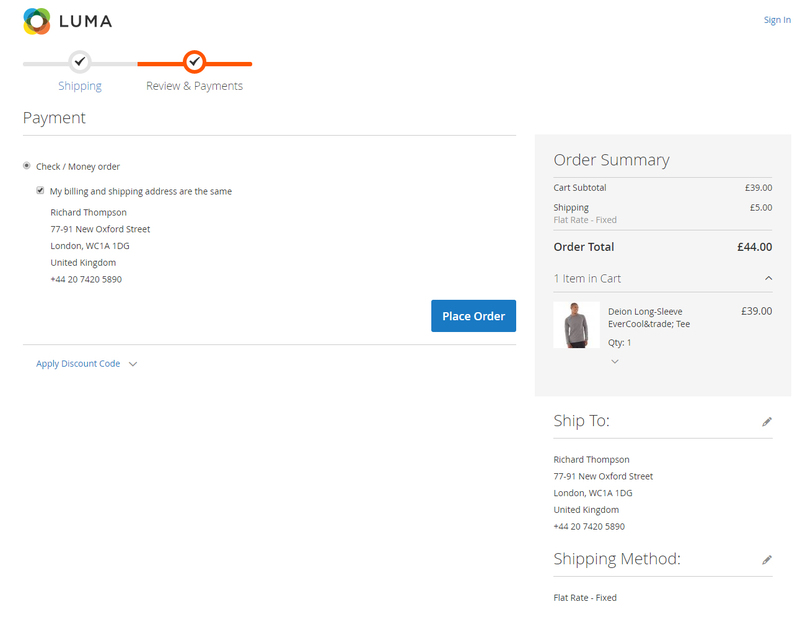 One of the biggest improvements in Magento 2’s checkout is its reduced, two-step flow, which comes as standard for both the blank and luma themes that come with the product. By default, Magento 1.x offered a six-step accordion checkout process – something that was pretty tiresome and reduced conversion rates due to its complexity. 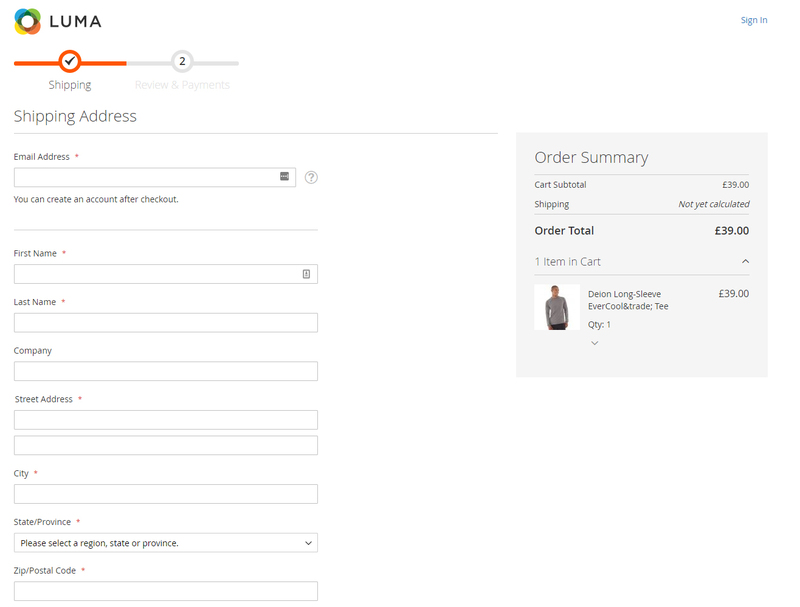 In Magento 2, however, the checkout is now split out into two simple steps: shipping and payment. Another great feature of Magento 2 is making the guest checkout standard. When first entering the checkout, the platform now assumes a vistor is a guest, so the user won't be presented with a login or registration form before entering the checkout. Customers are presented with a simple form asking for their email address and shipping details. If the entered email address matches an account that's already been created, the customer will be given the option to login, along with a forgotten password link. This is great from a customer point of view. You aren’t forced to create an account and you only provide the details needed to make your purchase. If you want to create an account you're offered this option at the end of the process, improving the login process and reducing customer friction. This ultimately puts the consumer in control, with the choice of logging-in or being a guest. It’s totally up to them. Magento now allows a floating minicart to appear on the right hand side of the screen. The minicart is reponsive, and on mobile it slides-in when the minicart button is clicked in the checkout. The point of this is to provide a complete breakdown of the items a customer has ordered with images, allowing them to toggle that order summary on and off to reveal more or less information. By default it shows the total of an order. When expanded it reveals each individual product ordered, along with the quanties of each item. This gives a customer more power and the confidence that they're ordering exactly what they expect – that they haven’t accidentally added something to their cart. Once a customer enters their shipping address – most notably the country, region or postcode – the shipping rates are recaluclated and shown. How you setup your shipping rates is up to you as a business. You can offer free shipping over a certain value, special rates for certain products, or a flat rate per product. You can also set allowed countries so that only those countries will produce valid shipping rates. From a user perspective this is a great feature as it allows the customer to instantly see exactly how much the order total will be. Once a user's required shipping rate is selected, it's added to the minicart total on the right of the checkout, so it's easy for them to see how each shipping rate affects the order total. Once the shipping rate is selected, it's onto the payment step. Another big improvement over Magento 1.x with Magento 2 is the ease with which custom payment methods can be integrated into the checkout. A number of default payment options are available – the most notable one being PayPal which comes bundled with Magento 2. Unlike Magento 1.X, different payment methods have been well thought out in Magento 2 which is designed to support multiple payment methods and allow vendors to create their own payment modules, with easy integration with a merchant's checkout. The billing address is no longer a required option as this is now handled by each indiviudal payment module. If the payment method doesn’t require a billing address, you don’t have to provide one. The payment step also gives you a summary of your shipping information in addition to the minicart, making it easy for customers to see a summary of everything they've chosen before they click on the 'place order' button. The Magento 2 checkout is a vast improvement over the Magento 1.x version. It greatly reduces checkout friction for the customer and puts them in control of the whole process.